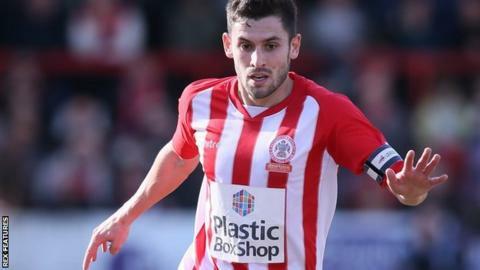 Accrington Stanley moved up to second in League Two with a narrow win at Hartlepool United. Seamus Conneely gave Stanley an early lead with a firmly struck volley after just three minutes. Hartlepool levelled through Rakish Bingham's header at the back post before Tarique Fosu-Henry slotted home after Josh Windass had hit a post. Stanley had started the day in fourth but have now moved ahead of both Oxford and Plymouth. Match ends, Hartlepool United 1, Accrington Stanley 2. Second Half ends, Hartlepool United 1, Accrington Stanley 2. Jordan Richards (Hartlepool United) wins a free kick in the attacking half. Foul by Josh Laurent (Hartlepool United). Attempt missed. Shay McCartan (Accrington Stanley) right footed shot from the right side of the box is close, but misses to the right following a corner. Corner, Accrington Stanley. Conceded by Adam Jackson. Substitution, Hartlepool United. Rhys Oates replaces Rakish Bingham. Attempt missed. Tom Davies (Accrington Stanley) header from the centre of the box is close, but misses to the right following a corner. Corner, Accrington Stanley. Conceded by Jake Carroll. Substitution, Accrington Stanley. Shay McCartan replaces Tarique Fosu-Henry. Josh Windass (Accrington Stanley) is shown the yellow card. Josh Windass (Accrington Stanley) has gone down, but that's a dive. Attempt saved. Tarique Fosu-Henry (Accrington Stanley) right footed shot from outside the box is saved in the bottom left corner. Attempt saved. Adam Jackson (Hartlepool United) right footed shot from outside the box is saved in the centre of the goal. Josh Laurent (Hartlepool United) wins a free kick in the defensive half. Attempt saved. Matthew Bates (Hartlepool United) header from the right side of the six yard box is saved in the centre of the goal. Hand ball by Tarique Fosu-Henry (Accrington Stanley). Substitution, Hartlepool United. Luke James replaces Jake Gray. Corner, Accrington Stanley. Conceded by Matthew Bates. Attempt blocked. Jordan Richards (Hartlepool United) right footed shot from outside the box is blocked. Jake Gray (Hartlepool United) wins a free kick in the defensive half.